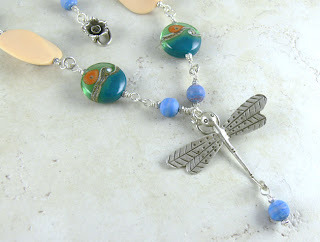 This month's picks from ArtBeads.com was a selection of Thai Hill Tribe silver. I love Thai silver because of all the unusual shapes and designs it comes in. It has a higher silver content than sterling silver, which allows for the bending and shaping needed to create such unique beads. For my first piece, I chose a dragonfly pendant and a rose clasp. I then used handmade lampwork beads and large vintage lucite pieces (I swear, I couldn't stop thinking of vanilla pudding the entire time I was working!) to create the necklace. 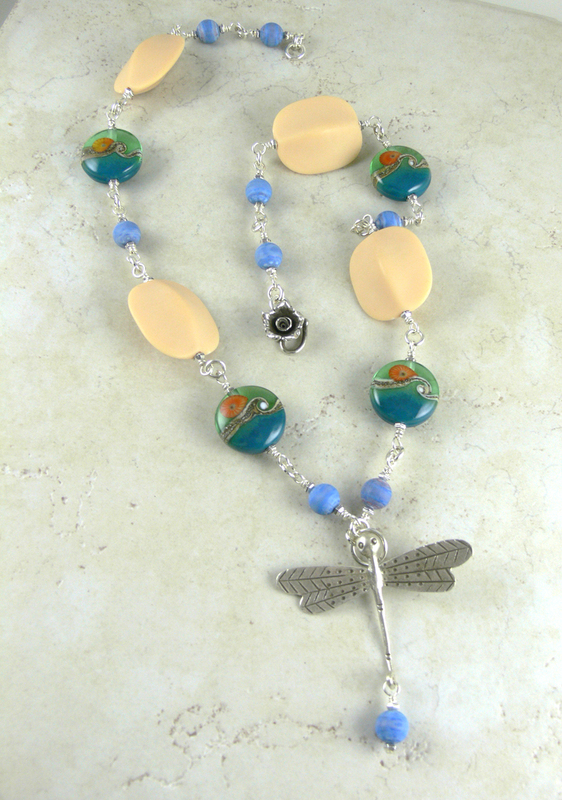 I altered the dragonfly, curling up its tail to hold one of the vintage lucite beads. 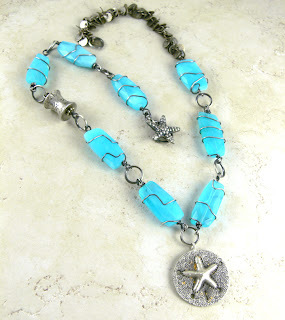 Next, I chose a sand dollar pendant and a starfish clasp. 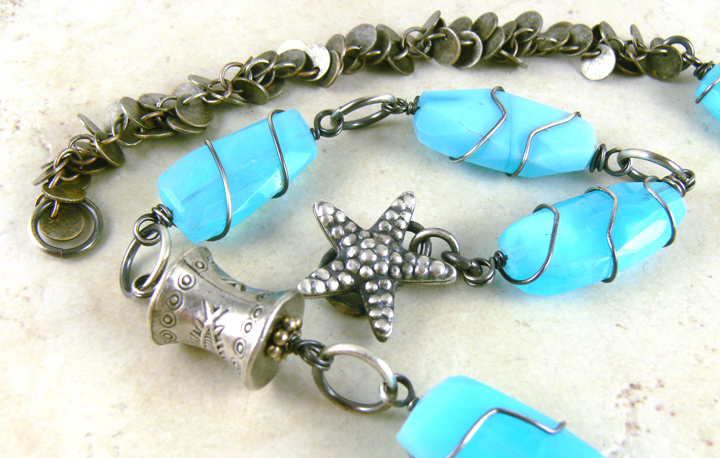 The starfish clasp came in bright silver, so I oxidized it with liver of sulphur and then brushed it with 000 steel wool. I then wrapped long nuggets of Peruvian blue opal with oxidized sterling silver and added another Thai silver bead (which I also oxidized) and a length of funky chain. I loved working with this month's picks, and hope you enjoyed viewing them! Check out www.ArtBeads.com for more fun beads! Find all the Hill Tribe beads you need by clicking here. Disclosure...As a reviewer of products at Artbeads.com, I receive the beads above free of charge. I have been asked to review these products and give my honest opinion of the products...positive or negative. I am not being compensated by Artbeads.com for my endorsement as it pertains to the products received and reviewed. 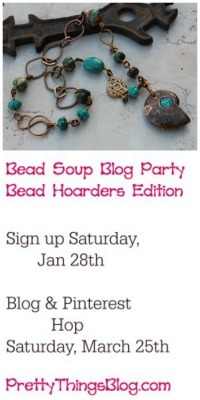 lori, i am so sorry that i'm having to "email" you on your blog post! i can't find your email address. 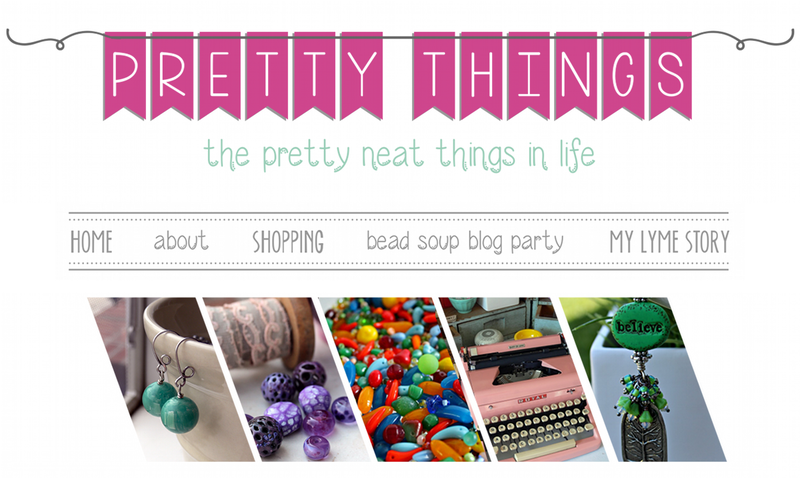 first, your designs in this post are darling - i am especially drawn to the second one. i wanted to thank you for leaving a comment on my "touches the heart" blog post and to tell you that I so agree with you. And isn't it wonderful, the support we receive from women we've never met but are such good friends with through blogging! 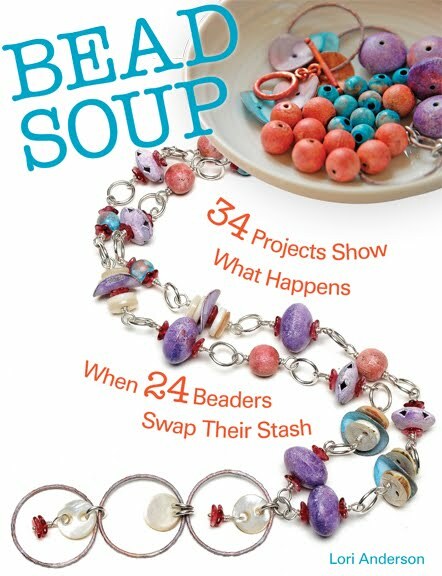 i am now following your blog - and, i must tell you that i saw one of your lampwork necklaces and spent HOURS on etsy trying to find a shop that sells those beads. Both are awesome!!! but i especially love the starfish one. Such great pieces! I love Hill Tribe sterling...it has such a great organic look to it. They are beautiful, I too love Hill Tribe silver, wouldn't it be nice to visit the artisans in Thailand. I love Hill Tribe silver. I'm partial to dragonflies (as you know), but think I like the shell best ... both are wonderful. 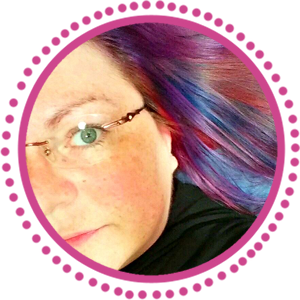 So pretty, Lori! What pretty designs using some of my favorite type so of beads - Hill Tribe silver! These are really lovely creations. I really like Thai Hill Tribe silver too. I got a commission for two bracelets from a bride at the weekend on a seaside theme for her bridesmaids and instantly thought of the starfish and shells! Hope I do as well as yours! Great choices! I don't do any stringing type jewelry anymore (at least now) but I sure admire it! OMG, Lori, how fabulous they are!!! I simply ADOOOORE the dragonfly one! Lori, both necklaces are lovely,I am very fond of Peruvian blue opal.... mmm I love Hill Tribe silver always keep a box handy lol. Beautiful, Lori. I LOVE the sand dollar pendant.